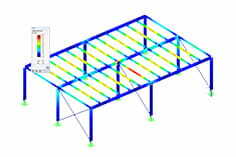 RF-/STEEL EC3 allows you to perform plastic designs of cross‑sections according to EN 1993‑1‑1 , Chap. 6.2. You should pay attention to the interaction of loading due to bending and axial force for I‑sections, which is regulated in Chap. 6.2.9.1. The standard sets a limit for α at 0.5, and the lowest value of rolled cross‑sections is about 0.2. Graphical evaluation of the interaction according to EN 1993‑1‑1  and DIN 18800 shows almost the same results for the small α. The efficiency of the plastic design of cross‑sections depends mainly on the cross‑section parameter α. The evaluation of the current cross‑section series gives the following distribution. This situation can be explained in a simple example. As you can see, a significantly higher load (pure cross‑section design without stability analysis) can be reached when using the cross‑section IPE 200 according to EN 1993‑1‑1  rather than according to DIN 18800. Manual RF-/STEEL EC3. (2014). 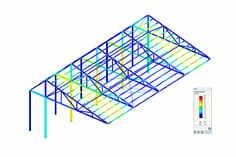 Tiefenbach: Dlubal Software. Download. Training Manual EC3. (2016). 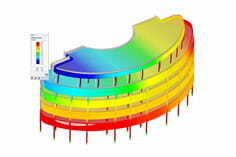 Leipzig: Dlubal Software.